Trainer Magazine - the horse racing magazine for the training and development of the thoroughbred racehorse. Europe and North America. The lifeblood of Thoroughbred racing has always been its owners, and in recent years there have been many creative ways to attract newcomers to the sport, as well as retain those already in it. Rather than sitting back and waiting for new clients to seek their services, trainers have taken a proactive role in bolstering their business, often in partnership with farms and racetracks, while industry organizations are increasingly focused on providing a plethora of information as well as assistance to prospective owners. Taylor, who serves on Keeneland’s Board of Directors and the Keeneland Executive Board, is also a board member of Horse Country, Inc., an organization of horse farms, equine medical clinics and equine attractions, the aim of which is to develop fans and future owners of the sports through tourism. For a small fee, people can sign up for tours of Lexington-area farms on the web site visithorsecountry.com. “Kentucky is in a prime spot,” said Taylor. “And where Lexington is situated is about a six-to-eight hour drive of three-quarters of the United States population. We have the Bourbon Trail here, and tours of distilleries are very popular. About 2-½ years ago myself, Headley Bell, Price Bell, Brutus Clay and others thought we should have a similar venture for the Thoroughbred industry. We started Horse Country, and we feel Kentucky can be a destination for travelers. Our first year we had about 1,800 people sign up for tours here at Taylor Made, while this year we’re looking at about 9,000, so it’s growing. We could have even bigger growth if marketed correctly. “Of those 9,000 people, maybe 40 are interested in doing something, so we plant the seeds in people’s minds about ownership,” said Taylor. Taylor Made has branched out into other areas to attract new owners, including a pinhooking venture with Bloodstock Investments, run by Katie Taylor-Marshall, and Medallion Racing, a racing partnership with the aim of offering an ideal experience for potential owners. Medallion, headed by racing manager Phillip Shelton, buys minority interest in graded stakes-caliber fillies, immediately bringing investors to the graded stakes level. 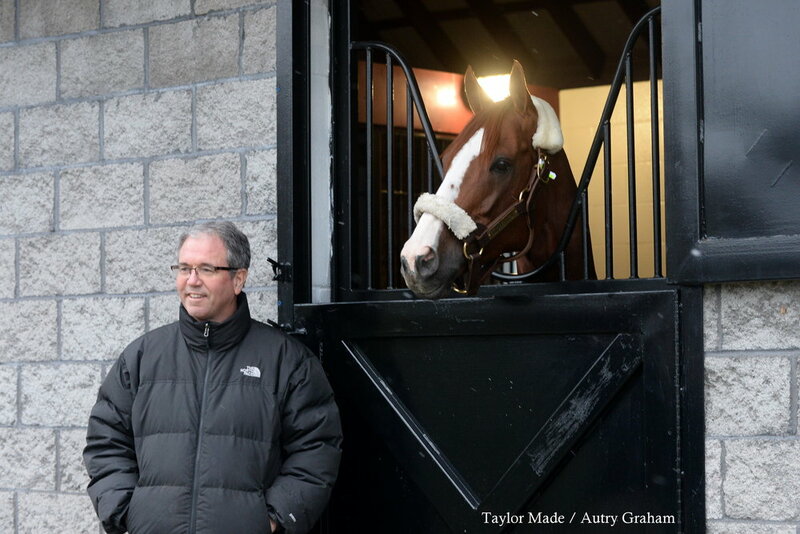 Taylor said there have been discussions about doing something, perhaps a syndicate, with progeny of Classic winner California Chrome, who stands at Taylor Made, but there isn’t anything on the table right now. The farm partnered with journalist Geoffrey Gray when he started the “People’s Horse” venture, which had 300 people sign up for $100 each and became “owners” of the Munnings mare Colorful Bride, in foal to the stallion. The birth of the Chrome foal was broadcast live on a “horsecam” that streamed around-the-clock from Colorful Bride’s stall, with an estimated 1,000 people watching. Taylor also feels that if the sport wants to get new fans and owners, it needs to treat horseplayers better. DON'T MISS OUT AND SUBSCRIBE TO RECEIVE THE NEXT FOUR ISSUES!